The scale of what 3D printing may be used for continues to grow. The Singapore Centre for 3D Printing, based at the Nanyang Technological University (NTU), is currently initiating a project to construct high-rise public housing using concrete 3D printing. 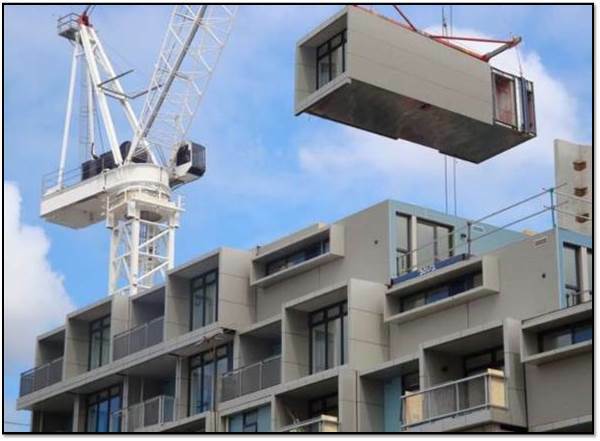 Relying on prefabricated prefinished volumetric construction (PPVC), developed in partnership with Singapore’s Urban Redevelopment Authority, NTU already plans to construct three dormitories from modular rooms later this year. PPVC, as a concept, involves building individual units off-site, which are then assembled on-site in a Lego-like manner. In the case of the center’s 3D-printed public housing, concrete 3D printing is being thrown into the mix for the fabrication of structural elements for these individual units. Image courtesy of Singapore’s Building and Construction Authority. The 3D-printed houses will likely feature non-structural elements made by traditional means; internal fixtures (windows, plumbing, electrical elements, lighting, fans, etc.) can be installed between each subsequent layer of concrete during the printing extrusion process. The complete unit can then be shipped to the construction site for assembly.A major difference with the center’s process, however, is the actual material and methods used to fabricate the rooms. Readers may recall concrete 3D printing from companies such as CyBe and Winsun, which produced 10 concrete homes that were 3D printed in 24 hours. Executive Director of the Singapore Center for 3D Printing, Chua Chee Kai, suggests an approach similar to that of Winsun’s in terms of modularity, but explains that the center will have to develop their own technology “from scratch” and says that he is working with an undisclosed company to test the idea. The exact nature of Chua’s approach has yet to be revealed, but, as of now, the two most frequent methods for printing concrete involve large gantry-style systems or industrial robotic arms that pour quick-drying concrete, pumped to the feeder, layer by layer, with the quick-drying concrete being key to ensuring that each layer can support the next. What is clear is that Chua’s approach will leverage the advantages of 3D printing and traditional PPVC buildings. According to NTU, PPVC is expected to “[save] up to 25 to 40 percent in manpower and 15 to 20 percent in construction time” when the dorms are built. Behrokh Khoshnevis at the University of Southern California (USC), a pioneer in 3D-printed construction, has said that concrete 3D printing has the potential to produce “a 2000 square foot house . . . in less than 24 hours,” while also minimizing waste through the printing of structures that are not fully dense. Unlike traditional construction, which typically relies on relatively standard geometries, 3D printing enables the laying down of unique geometries using a zigzag or hexagonal shape that provides the same structural integrity, without the same material waste as a fully dense wall.In turn, the reduction of concrete necessary to create a structurally-sound wall cuts costs in terms of money spent on building material and, by speeding up the construction process, man-hours can be reduced as well, further increasing savings for a given project. Overall, the process may be better for the environment. Khoshnevis has demonstrated a 50 percent reduction in the amount of energy required to produce a single 3D-printed wall versus a wall produced by a standard construction method. Behrokh Khoshnevis’s contour crafting-style concrete 3D printing. While the USC professor envisions that 3D printing on site will cut carbon dioxide emissions associated with transportation, it’s also easy to imagine that the Singapore Center for 3D Printing will be able to decrease labor and material waste and increase speed by combining modular construction with 3D printing. Before a project of this magnitude can be undertaken at full scale, it will certainly be necessary to ensure that 3D printing in construction meets the regulatory standards of the construction industry in Singapore. The endeavor has yet to be approved by the Singapore government, but Chua will officially propose the project to government agencies this year, with further plans to test a prototype in three years. Therefore, the project is still a long way from being implemented. 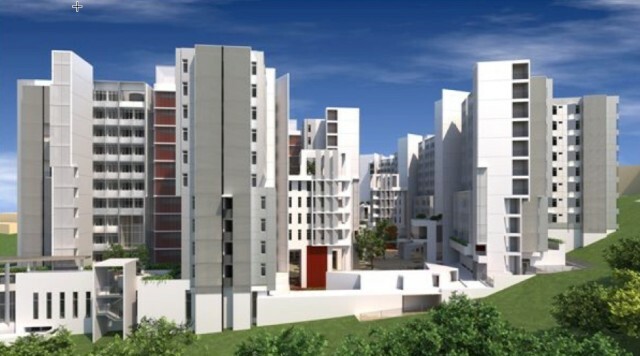 If it were to be executed, because of the role that public housing plays in the city-state, this project will have a significant impact on construction throughout Singapore. According to the government's Public Housing and Development Board, more than 80 percent of the population currently lives in public housing. And if this new technology works for Singapore’s public housing, it could also work for other purposes throughout the city.